Almost one-fifth of families in Israel live in poverty, the highest rate among OECD countries. Over the past number of decades, the perception of poverty in Israel and methods for coping with it have changed. This time period was characterized by a sharp decrease in the scope and accessibility of Income Support, which acts as a safety net for families living in poverty and is provided by the National Insurance Institute (NII), as well as a limited budget allocated for emergency assistance to impoverished families. Alongside the NII allowances, there have been efforts in the past decade to offer people living in poverty comprehensive programs that include providing material assistance through local social services departments. The Ministry of Social Affairs and Social Services’ flagship program for this is the Breath of Relief program. Today, assistance to impoverished families is granted mainly through Income Support distributed by the NII, while a smaller amount, earmarked for financing emergency assistance, is provided by local social services departments. Since the turn of the century, Israel has shifted from a “welfare-to-work” model to more of a “social investment” and “poverty-aware” approach to social welfare. Economic instability in the early 2000s resulted in a sharp reduction in the level of Income Support and more stringent eligibility requirements, such that the share of families receiving Income Support declined from 8% to 3% by 2017. The early 2000s also witnessed an acceleration of the outsourcing of social services to civil society organizations and private companies. In 2004, a welfare-to-work program was established to encourage Income Support recipients to integrate into the labor market, but was discontinued after a short trial period. The Elalouf Committee recommendations following the 2011 social protests were designed to strengthen education, housing and employment, and to improve the human capital of families living in poverty. The “poverty-aware social work” paradigm, which emerged in 2010, directed the discourse on poverty to families’ social rights, and paved the way for the comprehensive Breath of Relief program. The Breath of Relief program has been in operation since 2015 and consists of two main components: (1) Rights Centers – community centers focused on the take-up of people’s social rights and the implementation of employment and community programs; (2) An intensive 2-year family support program that includes a flexible family budget and social worker intervention. The cost of this program is NIS 100 million a year. Each family participating in the program receives NIS 8,000 a year, allocated at the discretion of social workers and in consultation with the families. By the end of 2018, approximately 5,700 families had been reached through the program, of which 41% were from the Arab and Bedouin sectors, and 44% from the north of the country. About 40% of recipient families have four or more children, and about 64% of the Jewish participant families (not including Haredim) are headed by single parents. The parents in most of the families have 12 years of schooling, 17% have studied in higher education, and 27% have less than a high school education. Most participants in the program are employed, but their incomes are low and allowances comprise the major source of their livelihood. About 70% of the families in the program reported being in debt, and it is reasonable to assume that the real percentage is even higher. The flexible budget seems to serve families for a variety of expenses: household needs, employment, paying off debt, and more. However, not all recipient families use the assistance to the fullest extent and they avail of the funds to cover different types of expenses. The sum used during the first year of the two-year program stands at only NIS 4,200, on average – a little over half of the total allocated sum. However, those who joined the program in 2017 used a larger sum. Overall, about 42% of the assistance is used by families for household needs (electrical appliances, furnishings, and household goods), about 28% is spent on employment (training advising, and equipment), and about 10% is spent on paying off debt. 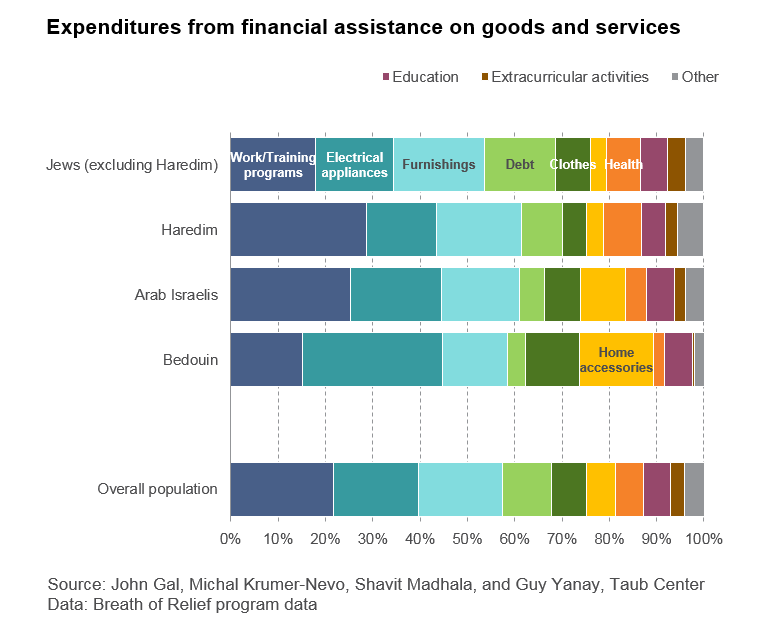 Among Arab Israeli families, a large share of the assistance is spent on electrical appliances and home accessories. This is particularly true among the Bedouin, where about 50% of the assistance is spent on household needs. The differences in the ways in which the recipient families use the aid indicate the need to maintain the flexible nature of these budgets so that they can provide a real response to the different needs of the families participating in the program.